Modified the toe box to improve riding appeal. Modified the toe box to improve riding appeal. Redesigned the accordion flex zones offer superior comfort. This boot present particular attention to the ankles area: on the external area it is visible the TPU external ankle protector, while on the medial side it is applied the ankle disk double density layered under the upper. 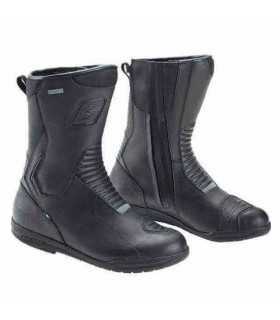 External TPU Heel counter which offer an extra driving protection. TPU shift pad. Internal hot-melt reinforcement layered under the shin plate upper with heat pressed Astars logo. Rear reflex for a better visibility. Adjustable strap for the important instep closure and adjustable Velcro on top closure. Collar inner lining made of textile. Waterproof lining. Internal toe box is layered under the upper. Contoured insole injected high modulus polyamide including the shank reinforcement. Removable anatomic EVA foam footbed. 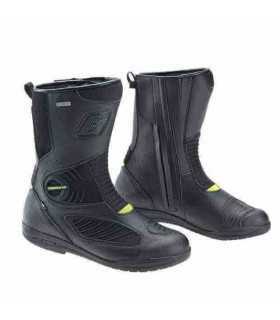 Alpinestars exclusive vulcanized rubber compound sole. 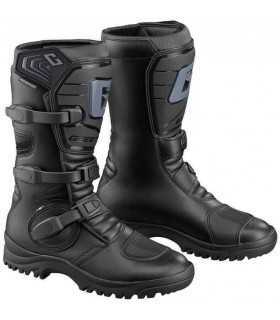 The Gunner WP boot is CE certified.